Final the article in it's original form by clicking the link above. There are a specific set of rules with the transition of running shoes. Transitioning to a new running shoe, or completely changing them all together requires a protocol. You see, no one pair of shoes is the same. Yes. Even the exact same pair, year, and model are different. Whether you’re looking to transition to vibrams, minimalist, or simply don the exact same pair, you need to allow time for adaptation. I’ve been running in Asics Speed Stars for years. Unfortunately, they decided to discontinue the shoe resulting in the need to find a new shoe. As our shoes wear, the flexibility improves. With an increase in flexibility comes a decrease in support. With a decrease in support comes a larger requirement of strength. Even the wear pattern will change how your foot interacts with the ground. Luckily our body is great at adaptation. As the rubber wears and flexibility increases, our joints and muscles adapt to the change. The slow wear process makes the transformation possible. 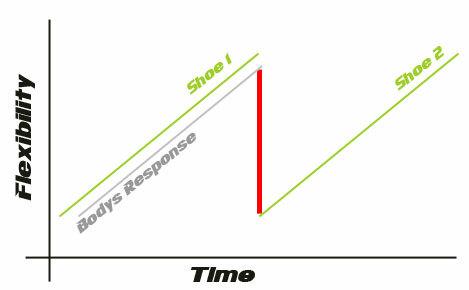 The above graph displays the adaptation of our body to our shoe wear. The mistake most runners commit is transitioning too fast from an old to new shoe. The red line displays the gap created from what your body is ‘used to’ and what you’re exposing it to when you don a new shoe. Unfortunately, there comes a point where the cushioning and support reach a critical point of needing replacement. If nothing else, you want a clean pair with less odor. You shuffle down to your local specialty running shop (always support local) and seek some new kicks. A simple rule: Stick to what your foot knows! Too many runners get caught up in the hype of colors and advertising. You should rarely change your shoe brand or category once you find the right fit. Even the same shoe is different. Changing to match your favorite running singlet will often result in a battery of overuse injuries. My clinical experience exposed an overwhelming trend, a shoe change (even the exact same pair) precedes an overuse injury by a few weeks (not always but often enough to note). The change is more drastic than you think. Try this test. Go for a run and before calling it quits, swap out your shoes and continue on for a quarter mile. You’ll be shocked by the overall experience. Your feet will be relaying a storm of confusion to your brain as you try to make sense of the switch. This works even if the pair of shoes are the exact same pair! They should, however, be different ages (out of box vs old). The key here is to wean into a new pair. Ideally, you would have a rotation of two pairs that are >6 weeks apart. What if your shoes still have some life in them? Then keep them in the rotation until you feel they’re toast. A simple four week rotation can allow for enough (again clinical and experienced observation) to allow the appropriate acclimatization. Go buy a second pair of shoes, we’ll call them Shoe 1 and Shoe 2. You’ll start the transition four weeks out from changing. If you’re one of those runners with a spreadsheet of every run you did (guilty), don’t freak out and start spending time working out the exact mileage (#runnerd). Twenty percent can be a single run. Maybe an easy run? The point is to spread out the transition as you break in your new pair. Once you’re into the new pair spend your time training in the latter pair until you feel they’re on their way out. Stick to what your foot knows! If your foot is used to a specific flexibility, stiffness, and support. Jumping into a brand new shoe, even the same exact one, can be devastating. Transition slowly. If you start to experience pain of any sorts with your transition, slow down and add your old shoes back into the mix.